I heard this red-bellied woodpecker, also known as Melanerpes carolinus, before I saw him. 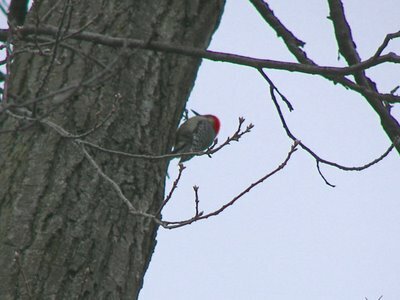 He was busy tapping out holes in one of my neighbor's trees. Unfortunately, I couldn't find my zoom lens in time to get a better picture of him, and he flew away before I could get in position to snap a clearer picture of the bird as he perched about thirty feet in the air. These birds have a reddish tinge on their bellies, from whence they get their name, in addition to the bright red head and nape feathers. I would have a little to early to see this guy doing his thing.